Hippophae, the sea buckthorns, are deciduous shrubs in the family Elaeagnaceae. It has been used as traditional therapies for diseases, such as diarrhea and dermatological disorders. 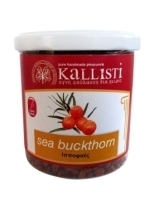 In Indian, Chinese and Tibetan medicines, sea buckthorn fruit may be added to medications in belief it affects pulmonary, gastrointestinal, cardiac, blood or metabolic disorders. It is a natural dietary supplement.